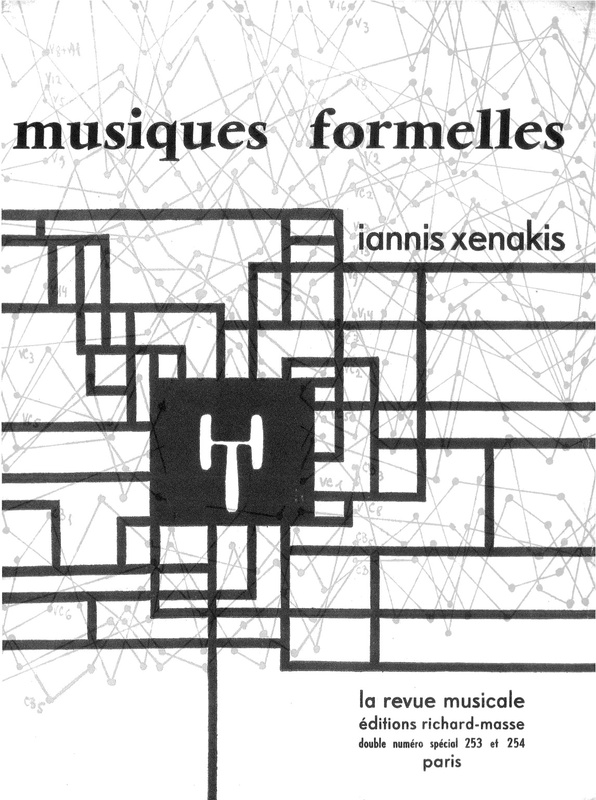 Musiques Formelles is certainly a fundamental book to explore the artistic career of Iannis Xenakis, and represents an important milestone for the historical path of computer music. The first point to make about this book is about the different editions that have been published over the years: four, equally distributed between French and English. The first edition is dated 1963 and was published as a special double-issue of the journal La Revue Musicale, an expanded version of this edition was published in 1981, by Stock Musique. While the first English version was published in 1971, titled Formalized Music, then reprinted by Pendragon Press in 1992. The version offered here is the historical one, the first, in the edition of the Revue Musicale. Xenakis published a book that stands as a path along the various applications of stochastic processes in music, whether for compositional analysis. This course takes place in five stages, as there are constituent chapters of this work. The central theme of this book, as I said, is the musical application of stochastic processes, although each chapter addresses from the different points of view. Musiques formelles is not a easy to read text, which devotes a large part of its contents to mathematics and its applications in music. The reader in search of a report on the activities of composition Xenakis they may be disappointed, and even confuse this book with a textbook of mathematics, given the abundance of formulas in it. The first chapter opens with an introductory overview on the use of stochastic processes in music, focusing on the analysis of the composition of Achorripsis (1956/57) for 21 instruments, realized through the application of four different probabilistic distributions, and then relying on stochastic procedures but without the use of technological tools, which is the central aspect of the chapter, namely the use of stochastic even in traditional environments. The next chapter focuses on the use of stochastic procedures for the purpose of music analysis, and is presented in two parts: the first theoretical and the second we could call it, exercising. In this chapter, Xenakis began to shift its focus towards electronic music, emphasizing, as an introduction to the chapter, such as stochastic processes are useful not only for the music composed for traditional instruments but also for that who makes use of electronic instruments; and useful, in addition, also for the realization of new sounds. If the first part of the chapter carries out a theoretical reflection on the subject, the second part explores the deeper proposing a practical application of the theories on two previous works of the composer: Analogique A (1958/59) for string orchestra and Analogique B (1958/59) for sinusoidal sounds. The third chapter is a time to reflect on their own work and theoretical investigation of some special settlement procedures. In this Xenakis focuses on the use of game theory to use as methodology for musical composition. In this regard focuses on the analysis of Duel (1958/59) for two directors and two orchestras, and Stratégie (1962), in which the selection of musical sequences to be performed was made through an IBM-7090. The fourth chapter is the one most closely linked to the use of computers for music composition. Subtitled Un cas d’utilisation de l’ordinateur 7090 IBM en composition musicale, the fourth chapter offers the look of Xeankis compared to the emerging reality of computer music. In the case treated in the book, we talk mostly about assisted composition, according to the model offered by Lejaren Hiller for his Illiac Suite, mentioned here, along with Max Mathews, a pioneer in the computerized sound synthesis. Also in this chapter Xenakis is not limited to purely theoretical, but rather to provide the reader with concrete examples of his work and the possibilities offered by the computer. So here is the presentation of ST/10-1, 080 262 (1962), a work for traditional instruments of which Xenakis analyzes the procedures used for the realization of the score. The book closes with a fifth chapter in which Xenakis analyzes others applications of mathematics in music. But it should be noted that the most current versions of this work does not end here, but they face other issues, deepening the mathematical aspects or analyzing the use of microsounds. Here you can see the complete pdf of Musique Formelles. It is a merged version of the single chapters already published on the official website dedicated to Iannis Xenakis.